Our goal is to service you when you need us and get it done right. This short video explains what we put in place to make sure we can do this for you everytime. The first step in terms of getting your garage door springs repaired or replaced is knowing what kind of spring system you have. There are two main spring systems: Torsion Springs and Extension Springs. Torsion springs are located above the opening of your door with springs slid onto a bar. Extension spring systems can be found alongside the opening of the door. It's important to know whether or not a garage door company provides service for your needs. Precision 's professionally trained technicians are fully equipped to work on torsion and extension spring systems. 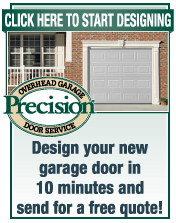 Call today to have a professionally trained technician repair you garage door today! Every homeowner can relate to how life's inconveniences are thrown at you at the worst possible times. The last thing you want to happen is have your car stuck in the garage when you need it most, especially when it's only been a couple months, weeks, or even days after your last garage door repair! 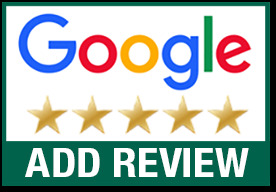 That's why Precision leads by example and follows the industry's best practices in order to make the best recommendation to homeowners each time we step foot in a garage. Most garage doors have two springs installed at the same time, when one breaks it's safe to say the second spring's life expectancy has just about expired. In order to save you from future inconvenience, unsafe garage door practices, and damaging your garage door opener, Precision will usually recommend to replace both springs. If you've had the same tires on your car for a while and one blows out while you're driving, wouldn't you replace them both? It's extremely important to properly maintain equipment such as garage doors and automobiles. Since garage doors come in all weights and sizes, the right springs need to be installed in order to properly balance the door. If a technician puts the wrong spring on your door, not only will this damage your garage door system, but it will cause the garage door opener to do more work than it was built to do. This is why Precision technicians only install the right springs for the door's weight and check their work by performing a balance test. With every spring repair, Precision provides a free safety inspection to make sure all the hardware and moving parts on your door are in good working condition and meet safety standards. Since the hardware was probably installed at the same as the springs, it's possible there are worn mechanical parts on your door that are in an unsafe state. Think about spring failure as a symptom to a possibly larger problem with your door. This is why it's a Precision Best Practice to provide a free safety inspection and maintain a safe environment for our customers. Call Precision today for garage door spring repair! In a 72 hour salt spray test performed by a third party research company, only Precision's Green Powder Coated Springs proved to be 100% resistant to corrosion. Precision installs a weather resistant powder coated spring to prevent corrosion and friction. We believe in our springs, so we put our name on them and we back them up with the industry's best warranty. Just like car tires are rated by miles, garage door springs are rated by an estimated number of cycles (1 cycle = your garage door going up AND down 1 time). The springs used by our competition range anywhere from 5,000-10,000 cycles, whereas we use a high-grade steel spring rated for 25,000-50,000 cycles! This is why we can put Lifetime Guarantee on our springs for as long as you live in your home! Call Precision now for Garage Door Spring Repair! When a company tells you they're providing you a warranty of only 90 days to 1 year, it means they could be using cheap hardware. We can provide an optional lifetime warranty on the hardware we use because it's superior to a traditional garage door company's hardware in a number of ways. 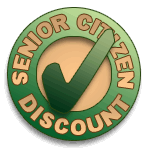 Call Precision today to learn more about our Lifetime Warranty! How Much Does Spring Repair Cost? The most common question we get over the phone is, "Okay, so how much does it cost to replace garage door springs?" To give you an exact price quote, we would need to know the size of the door, weight, and type of garage door springs needed (torsion or extension). Since we carry over 30 different types of springs to account for all the different types of garage doors, we recommend that a professionally trained technician takes the proper measurements himself before giving you an exact price quote. Call Precision today to have a professionally trained technician give you an estimate on garage door spring repair!